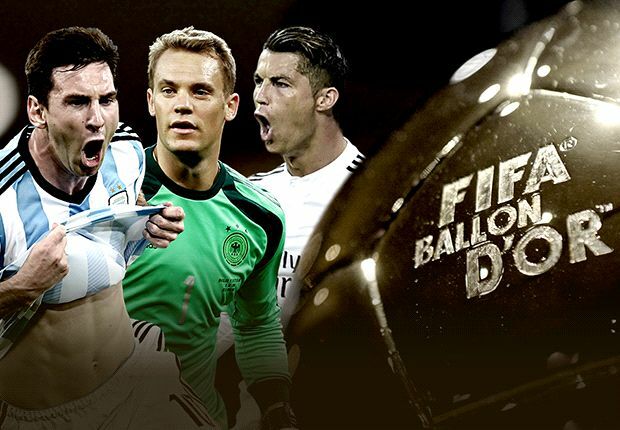 2014 was another wonderful year in the football calendar, with many of the best players stepping up to plate to produce scintillating quality that had fans on the edge of their seats. It was almost inevitable that Lionel Messi and Cristiano Ronaldo would continue their long-standing rivalry for supremacy, as the two best players on the planet delivered the sort of performances that separates them from the rest. Fans and pundits alike have become divided on who they consider to be number one, with the Fifa Ballon d’Or award seemingly the only way to officially separate the pair. However, they faced a severe threat from Bayern Munich goalkeeper Manuel Neuer who made the final shortlist for 2014 following a wonderful year in which the 28-year-old won the Bundesliga and lifted the World Cup with Germany in Brazil. Ronaldo arrived at the awards ceremony in Switzerland as the defending champion and favourite to retain his crown after a breath-taking year for the Portuguese superstar. The 29-year-old duly beat rival Messi and Neuer, who was unable to be the first goalkeeper since Lev Yashin in 1963 to be crowned the world’s best player, following a staggering 61 goals in 60 appearances for club and country, including the final goal in Real Madrid’s Champions League triumph over city rivals Atletico. Although he failed to live up to expectations as Portugal flattered to deceive once again at a major tournament and exited the World Cup at the group stage, 2014 was the year when Ronaldo came into his own as a player who has worked assiduously on all facets of his game to be the best. Scoring 28 goals in just 17 La Liga appearances for Real Madrid this season is merely one of many outstanding achievements Ronaldo has managed as records have tumbled by the wayside. Very few defences were able to stop the ominous threat of Ronaldo in 2014 who was involved in an incredible 83 goals for Real Madrid and Portugal (61 goals and 22 assists); although World Cup glory continues to allude him, winning the Champions League for the second time in his career after setting a new tournament record with 17 goals more than made up for the disappointment which followed in Brazil. There was almost an inevitability that something will happen whenever Ronaldo receives the ball, with unmatchable speed, power and shooting ability from almost anywhere inside the opposition’s half of the pitch making him virtually unstoppable. What does 2015 hold in store for Ronaldo? For the 2014 Ballon d’Or winner who is the complete player, it is difficult to think that the future will be anything but bright for Ronaldo who has fulfilled a lifetime ambition to be recognised as the best footballer in the world once again. There is no doubt that 2014 was Ronaldo’s year, but if early signs in 2015 are anything to go by, then Real Madrid and Portugal fans could be about to see their star man become even better. Ronaldo did, however, increase speculation that he could return to Manchester United by stating that anything is possible in football when asked where his future lye during a recent press conference. He has made no secret of his love and connection for his former club, but for now, Ronaldo must focus on being on top of his game for Real Madrid who are in a wonderful three-way battle with Barcelona and defending champions Atletico Madrid for the La Liga title. It is inevitable that Ronaldo will add to the 28 goals he has already scored in the league, and may has his eye on surpassing his own personal record of 46 which he managed during the 2011/2012 season.